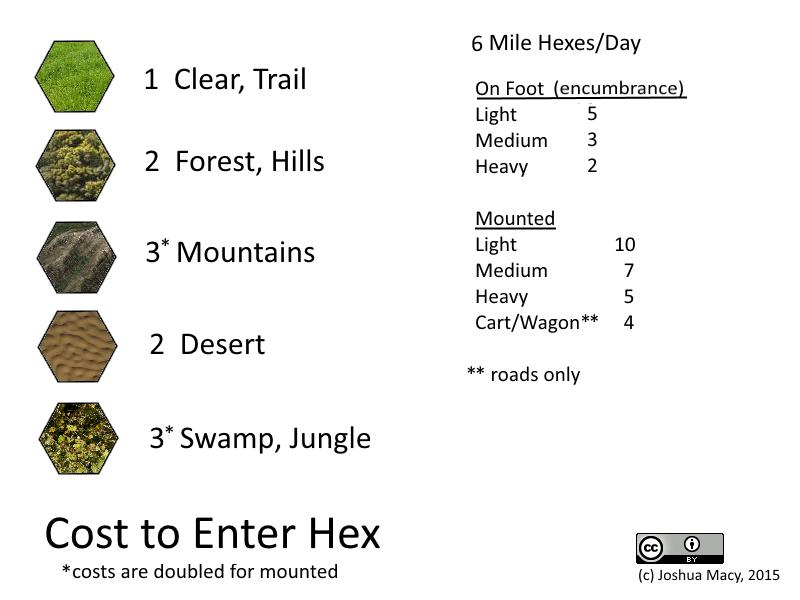 Another post that I never posted here, with a general way of handling overland travel based on the underlying Outdoor Survival/AD&D terrain and movement rates, simplified for easy use with pretty much any D&D-like. These templates show the cost to enter1 a hex on the overland travel map, with a key to how many hexes a party can move in a day based on the degree of encumbrance (for travelling on foot) or type of mount. The assumption is that roads and trails do not speed your travel enough to track, but they do allow you to pass over worse terrain as if you were on clear terrain. (mostly based on Delta’s discussion of the rates in Advanced Dungeons & Dragons 1e Dungeon Master’s Guide).